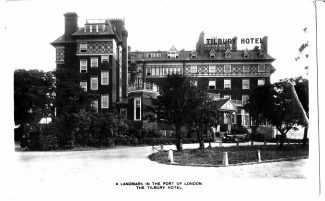 Before the Second World War, Charles Thomas Nichols who was a ship’s engineer on the Blue Funnel Line, collected postcards which he sent home from the European cities he visited (including Tilbury). He died in the 1980s and the collection passed to his family. This view of the Tilbury Hotel was apparently produced as a marketing tool by the hotel as the info on the back sounds like an advert and includes the phone numbers: “Tilbury 181 or 470”. Thanks to Seamus Heffernan for the information and image.